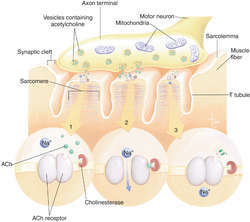 the synaptic connection of the axon of the motor neuron with a muscle fiber. See: motor endplate. The synaptic connection of the axon of the motor neuron with a muscle fiber. the junction of nerve and muscle fibers. Called also somatic myoneural junction; see also motor end-plate.